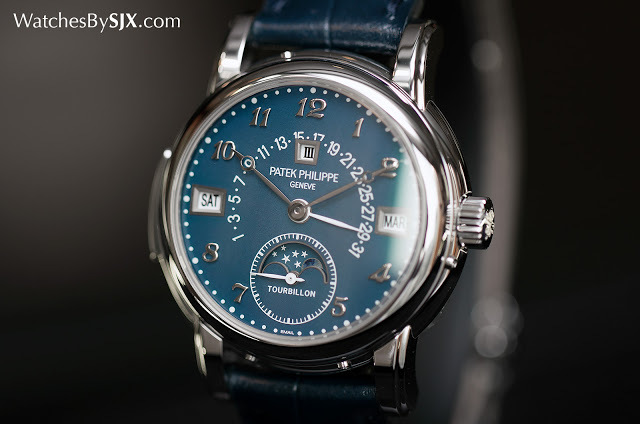 Literally a million dollar timepiece, the Patek Philippe ref. 5016A grand complication made for charity auction Only Watch is a one of a kind timepiece distinguished by a dark blue enamel dial as well as a stainless steel case. 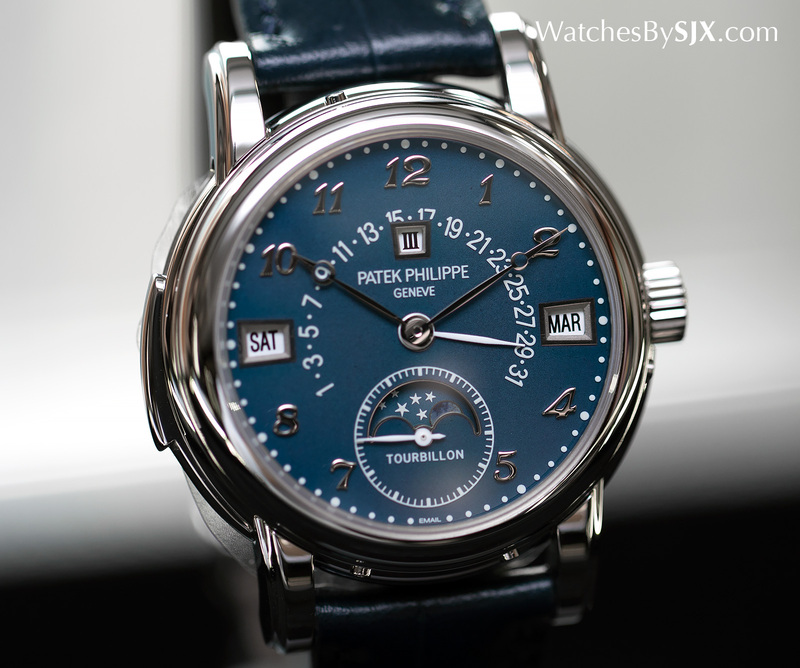 At the time of its introduction in 1993, the Patek Philippe reference 5016 was the brand’s most complicated wristwatch. Featuring a minute repeater, tourbillon and retrograde perpetual calendar, the reference 5016 was made in tiny quantities. Some 200 to 300 were made before it was discontinued in 2011. 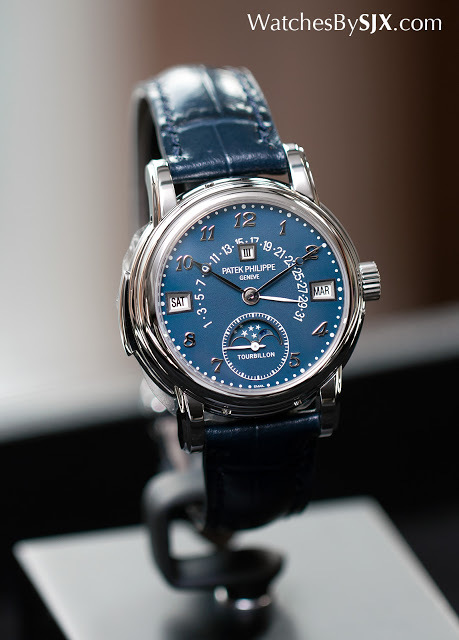 But that was not the last of the model, as Patek Philippe just resurrected it as the reference 5016A, an exceptionally valuable, one-off piece in stainless steel – for a good cause. The unique piece created for Only Watch, a biennial auction that raises fund for Duchenne muscular dystrophy research, is special in many ways, most notably the case metal. The “A” suffix in the model name is short for acier, or steel in English. Originally the reference 5016 was only offered in precious metals, namely the three colours of gold or platinum, while this is in stainless steel – the only one ever made in this metal. In fact, while Patek Philippe has manufactured one-off titanium wristwatches for Only Watch in earlier years, this is the first steel timepiece it has made for the event. Though an inexpensive material, stainless steel is prized by collectors. 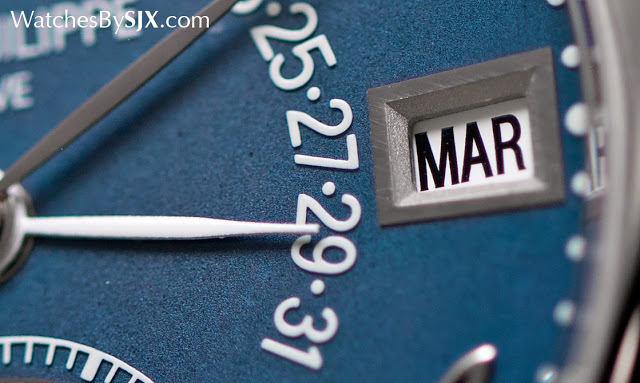 This preference for steel developed in the market for vintage watches, where highly complicated watches are usually found in more valuable materials. 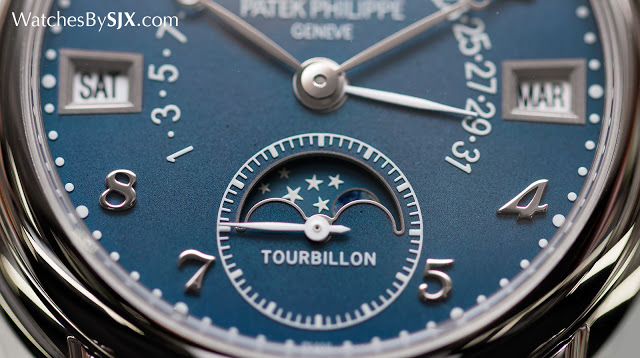 Even independent watchmaker F.P. Journe is doing the same with a limited edition set in stainless steel. Steel also offers a functional advantage for the minute repeater. Being less dense than gold or platinum, steel transmits sound better, meaning the 5016A should strike with greater volume and clarity than its precious metal counterparts. Another unique feature of the 5016A is the blue enamel dial. A restrained, dark blue that possesses a hint of grey, the dial has a matte finish with a grained texture characteristic of vitreous enamel, essentially melted glass fused to a metal base. 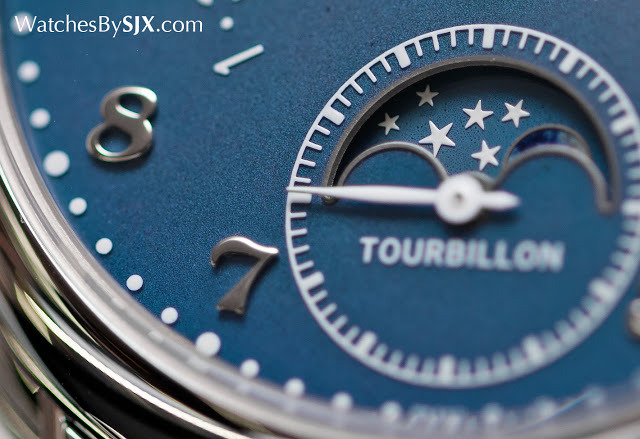 The minute markings, seconds track at six o’clock as well as the retrograde date numerals are in raised, white enamel. The rest of the dial elements – the Breguet hour numerals, frames for the calendar windows as well as hands – are all in white gold. The white gold frames for the day, month, leap year and moon phase are only found on this enamel dial, and not only the ordinary brass dials. That’s because the edges and sides of the windows are uneven, as is natural for enamel. Though the layout of the dial is identical to the ordinary reference 5016, this unique steel piece has one important difference – there is no serial number on the dial at six o’clock. 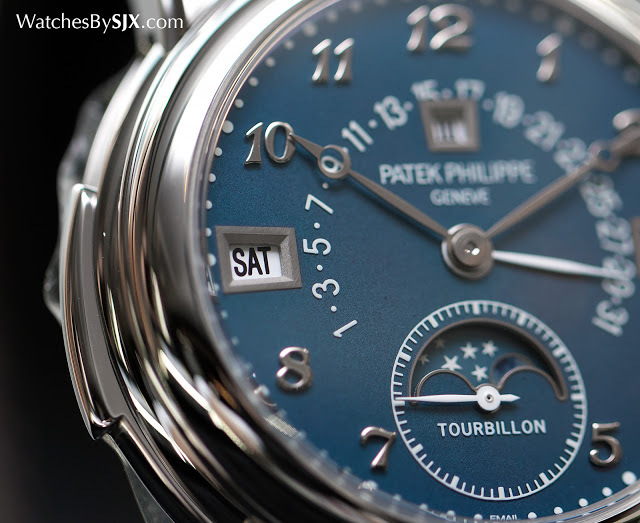 Patek Philippe traditionally prints the movement serial number on the dials of its tourbillon wristwatches, but this being unique needs no identifying mark. 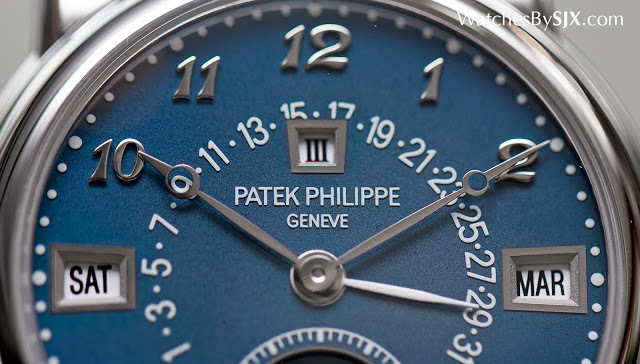 Like all highly complicated Patek Philippe wristwatches, the reference 5016A Only Watch is delivered with two case backs, one with a sapphire window and the other a solid steel back. This is lot 16 in the Only Watch sale that takes place on November 7 in Geneva. It carries an estimate of SFr700,000 to SFr900,000. Addition October 15, 2015: Estimate included in story.